Illustration designed by my talented teammate, Tori Duong. As someone who fell in love with design unconventionally, I was struggling to find peers at UCSD that I could connect with over my passion for design. I wasn’t a Cognitive Science/HCI major — I studied Communication and minored in Economics & Art History. I wasn’t well versed in the Human Computer Interaction or Neuroscience courses, but I wanted a space where I could build community through design. Enter Design at UCSD. I was invited to join the Design at UCSD Facebook Group by a friend. Initially, I wasn’t really sure what the organization’s value to me was. As a new member, I was intrigued by the club, but a bit confused by what Design at UCSD was. I had so many questions — was it for me? How could I contribute? Do they do design work? And how do I even become a member? The current logo for Design at UCSD. When I joined the board in December, I prioritized a conversation surrounding the organization’s branding. I wanted new members like myself to connect with the club immediately. After a lengthy discussion with the Graphic Studio team, we concluded the current brand identity wasn’t a good representation of what our club stood for. Reviewing the results of an anonymous executive board survey merely augmented the need to rebrand. We realized our board members thought that the current logo “didn’t stand out,” was too “generic” and “not sophisticated.” The four horizontal lines resembling Geisel Library were problematic for many, as the logo could represent anything from a Structural Engineering club to a Modern Art club at UCSD. There was also residual confusion from when the organization’s name switched from “Design.UCSD” to “Design at UCSD” last year — an operational change made in order to register the club as a student organization with the university. Upon deeper investigation, we found that the negative reactions to the brand identity stemmed from the fact that the brand identity did not resonate with the club’s existing but ambiguous core values. Something needed to change, and a two pronged solution was the answer. Ultimately, we wanted the rebrand to 1. Redefine our existing core values and 2. Highlight these core values through a new and improved look and feel. Our success metrics were both qualitative and quantitative. Qualitatively, we wanted to increase meaningful engagement within our club. We wanted club members to feel like they belonged in our organization. This could materialize in various forms — from coming out to club events to building sincere relationships with a design mentor. Quantitatively, we wanted to measure both in person and online engagement — from the number of students at weekly club meetings, to the number of website visits, clicks, length of stay and industry inquiries. Once our team made the decision to rebrand, the Graphic Studio team (comprised of myself, and my incredible teammates Kai-Chin and Tori) got to work. We spent a total of four months — from late December to early April — searching for inspiration, researching, interviewing and iterating. Step one for the Graphic Studio team was my favorite — inspiration gathering. We brainstormed a list of companies that we admired and started a team Pinterest board. We chose brands, websites, logos, illustrations and even Sriracha sauce boxes whose visual language resonated with what envisioned for our club. A sampling of images we saved to our Pinterest Board. Original designs created by: Side B (above), Ryan Putnam (top right) and André Moreira (bottom right). The bulk of our club’s online engagement comes from our 1500+ member Design at UCSD Facebook Group. We created a Google Form and posted it in our Facebook Group with five questions regarding our club, including: Who would you recommend this club to? and How would you describe this club to your friends? In addition to the Google Form, we created three polls within the group, asking users to vote for events they’ve enjoyed and future events they’d like to see. We incentivized filling out the form by giving stickers to members who completed all the questions. We encouraged participation in this survey at all of our weekly General Body Meetings, and reminded members at the check-in table at our events to fill out the survey. Although we had hoped for a higher number of responses, we received a total of 22 responses from members. In addition to interviewing members, we interviewed all 11 executive board members with a comprehensive questionnaire. For each question, we placed written responses into a word cloud to visualize the words that were mentioned most. Finally, we wrote out all of the most popular answers on a whiteboard in hopes of making connections between all of the responses. This was our initial whiteboard. We wrote down each question and 3–5 of the most popular answers. As we started to circle words that were repeated and made connections between words, we began to notice patterns. We saw the word “community” appearing over and over again, with members using the club to make friends, network and describing the club as “friendly” and “approachable.” We also started to sense the word “professionalism,” with experienced designers looking towards our club as a place to perfect their resumes, portfolios and attend recruiting events. Our members wanted to be more “industry ready”. Another theme emerged in the word “design.” Our members liked skill-based workshops, and hoped that the club would eventually foray into different types of human centered design. Ultimately, these three themes transformed into our three core values: community, industry ready and design. In addition, we saw places where we could improve. Some members thought our club was “exclusive” and a place that they did not belong. This type of feedback was a wakeup call for us on the board to brainstorm ways we could promote belonging within our club — something we’re actively working on. This was our final whiteboard. We made connections between all of the most popular answers and formed our core values, design personas and future goals. Sam is an undeclared freshman at UCSD. He has no design experience, and no prior experience with design tools or coding. He heard about the club through tabling on Library Walk. He doesn’t really know what Cognitive Science is, but is exploring that major. Sam needs a place where he can dip his toes into design, perhaps find a mentor to help answer any questions he may have, and to figure out if design is what he wants to pursue. Beth is a junior at UCSD. She is a Cognitive Science major with a concentration in Human Computer Interaction. Beth has taken design courses at UCSD, and has a portfolio that showcases her class projects. Beth is trying to get her first summer internship. She’s familiar with user research, but wants to improve her visual and interaction design skills. She needs a place where she can attend recruiting events, or portfolio and interviewing workshops. What is this club? Is it worth it for us to collaborate with them? What have you done with other companies in the past? Who and where are design club alumni? Is there talent here? Alongside the core values and personas, we also utilized feedback from our interviews to make future goals. Ultimately, we hope Design at UCSD moves beyond technology oriented design and focus on human centered design in general — including product design, visual design, motion design, customer experience design and service design. We also hope to increase meaningful connections within the club and through the club with both alumni and industry professionals. After the Inspiration phase of our design process concluded, we were excited to get started on the first ideations of our logo. Kai-Chin, Tori and I sketched out ideas for the logo individually. The only requirement for our sketches was that the new logo should reflect our three values: community, industry ready and design. Kai-Chin utilized the post-it, an iconic design tool used in prototyping sessions, to iterate on a potential logo. He was also inspired by “human centered design” — literally — and brainstormed ideas surrounding a human figure at the center of our logo. I was inspired by the visual representations of wire framing and created a four part logo — with each part representing a different core value of our club. I was also inspired by the board game Set — a game where symbols and shapes are meant to be easily identified. Similarly, we wanted our club’s visual identity to be immediately associated with our core values. I sketched out this layered diamond look, playing around with different opacities and colors. And finally, thanks to my contemporary art class, I was inspired by symmetry of Piet Mondrian’s works and Rubix Cubes, and created this rainbow colored cube. The symmetry creates a sense of balance and inclusiveness. We presented all of these initial sketches at an executive board meeting and collected feedback and critiques via an in-depth Google Form survey. We wanted to make sure that the board was highly integrated into our design process, and their thoughts on which design best reflected our core values. After reviewing the board’s feedback, we began to hover around two distinct ideas: one, a logo with 4 distinct shapes (gathering inspiration from my wireframe-inspired sketch), and two, a logo with a layered look (gathering inspiration from Tori’s layered “D,” Kai-Chin’s layered post-its and my diamond sketch). Kai-Chin, Tori and I decided to each digitize an iteration of both ideas. After presenting all of our logo iterations, we went back to the board meeting to ask for critique and feedback. We also conducted a vote to see which logo would best represent our core values: community, industry ready and design. Additionally, we wanted the logo to resonate across all three of our design personas: Sam the newbie, Beth the job seeker and Chris the recruiter. Ultimately, we decided to go with the logo that garnered 63.6% of the vote: the 4-shapes design with the red, yellow, green and blue icons. The yellow briefcase represents our industry ready core value. The two-toned yellow briefcase will represent events that our club organizes surrounding jobs. Recruiting, resume building and interviewing events that Beth would be interested fall into this category. In addition, recruiters like Chris will partner with our organization to bring companies searching for design interns to UCSD. The red pie represents our community core value. The two-toned red pie represents events surrounding building community and culture. The darker red symbolizes one “slice” of the pie — with each member analogous to a “slice” of our entire pie. Newbies like Sam would be most interested in these events. The green menu represents our design core value, which we split into two for the purposes of this logo. The green navigation menu, which is seen across a multitude of mobile applications, represents design skills. Events including Sketch Workshops, Illustration workshops and more would be placed into this category. Both newbies like Sam and more experienced designers like Beth could benefit from these skill-based events. The blue bar graph also represents our design core value. The blue bar graph represents data and research design skills. Events including UX Research and Usability Testing workshops would fall into this category. Again, both Sam and Beth would benefit from these research and data-based design events. A before and after look at the Design at UCSD logo. 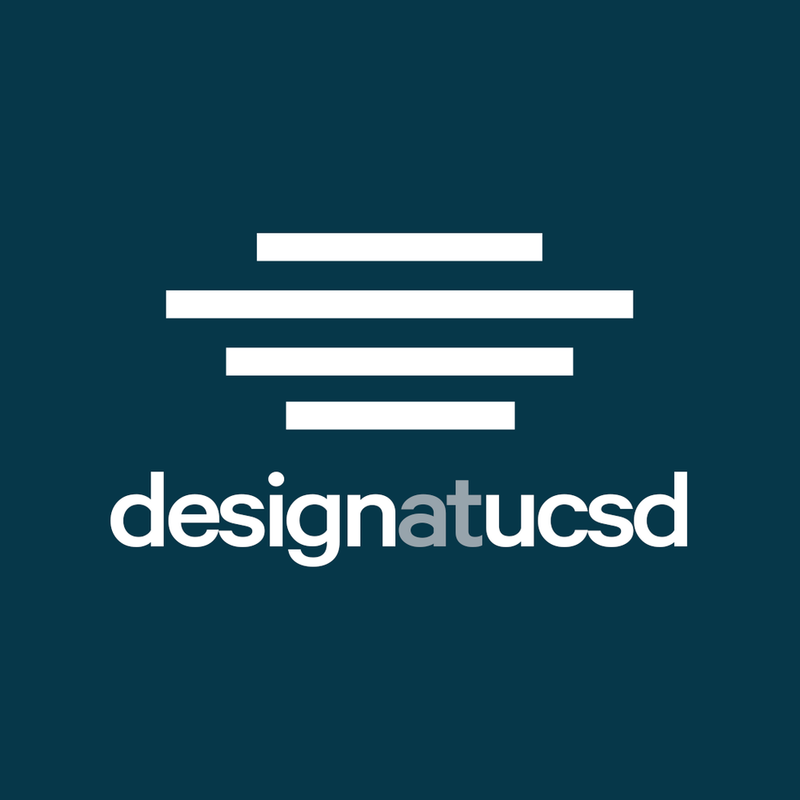 In the initial logo, all of the letters in “Design at UCSD” were the same size, font, and weight — the only difference was the color in “at.” In the new logo, we wanted the word “design” to be highlighted, after all, one of our organization’s core values is design. Based on feedback received at our design critiques, we saw that a majority of users were immediately drawn to the word “design” — simply due to its larger size. Given that a majority of our users are located on the UCSD campus, “at UCSD” is now a secondary header. As we start to roll out the rebrand tomorrow, we know that the work won’t stop. We’ll be continuing to research, learn and iterate better ways to brand our club for users like Sam, Beth and Chris. Extending a sincere congratulations to my Graphic Studio partners, Kai-Chin Shih and Tori Duong. Special thanks to all members of the Design at UCSD executive board — especially Ed Ngai and Elmer Barrera for sitting in on so many meetings and Vincent Liaw for his exceptional work on our new site. This post is also available at https://medium.com/design-at-ucsd/a-new-look-for-design-at-ucsd-e02996cce0f0.